Baltimore Gas and Electric has reported major progress in fixing underground electrical cables that were damaged after an early morning fire in downtown Baltimore. 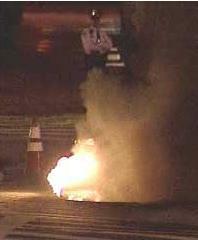 The fire sent smoke and flames shooting from a manhole early Monday. More than 1,400 state employees and nearly 1,000 city employees had Monday off because there was no electricity at their offices, including the headquarters of the state Department of Labor, Licensing and Regulation; the Maryland Insurance Administration; the Clarence Mitchell courthouse and City Hall. The Department of General Services said Monday afternoon that all six state buildings closed because of the fire and power outage will be open on Tuesday. BGE crews worked to make the underground area safe so they could take a good look at the damage and determine the extent and cause of the fire.